In my dissertation I analyze the perception of Japan in 19th century German-speaking missionary periodicals. With this I want to contribute to the controversially discussed specific representation of Japan in Germany. Due to their far-ranging circulation and expansive readership, missionary periodicals are well suited to examine the representation of Japan in a broader context: how was Japan portrayed in German Protestant and Catholic missionary periodicals between 1820 and 1915? To what extent did early modern reports from Japan shape the image of Japan before the beginning of the Christian mission in 1859? How did the presentation change after 1859 and 1885 or 1908, when German missionaries from Japan reported for the first time? To what extent were the publishers of the missionary magazines interconnected? What influence did the Kulturkampf have on reporting? 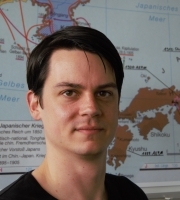 Were reports of Japan politically exploited during the Kulturkampf? To structure my analysis, I use a historical periodization, which is based on three interlinked temporal layers of construction and representation of Japan in missionary periodicals. These are characterized by specific historical context’s. My dissertation approaches this complex temporal structure with the help of specific research approaches: the history of mission and knowledge, the history of perceptions and representations as well as the history of nations and confessions, which structure the analysis as historiographic guiding perspectives and brings them together from a perspective of entangled history.